Camshaft locking tool – No.KM-953. Camshaft position (CMP) sensor disc setting tool – No.KM-954. Crankshaft timing pin – No.KM-952. Crankshaft pulley holding tool 1 – No.KM-6013. Crankshaft pulley holding tool 2 – No.KM-956. Timing chain tensioner locking pin – No.KM-955-1. DO NOT use special tools listed above to lock engine when slackening sprocket or pulley bolts. Turn crankshaft until just before TDC mark on No.1 cylinder  . Remove blanking plug from cylinder block. Slowly turn crankshaft clockwise until timing pin  can be inserted in crankshaft. Ensure camshaft lobes for No.1 cylinder angled upwards. Insert camshaft locking tool in rear of camshafts  . Install camshaft position (CMP) sensor disc setting tool  . Remove blanking plug from timing chain front cover  . 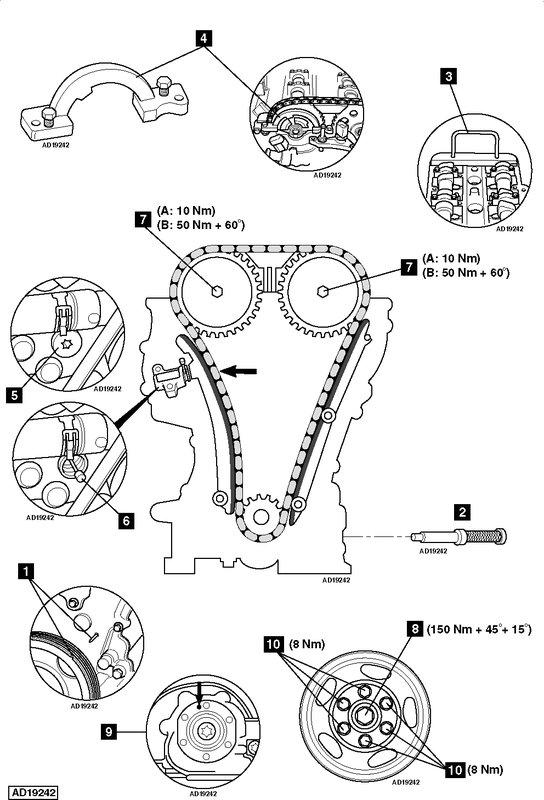 Compress timing chain tensioner and lock with timing chain tensioner locking pin  . If necessary, slacken bolt of each camshaft sprocket to adjust valve timing position  . NOTE: Camshaft sprocket bolts MUST only be used once  . Stage A – 10 Nm. Stage B – 50 Nm + 60°. During installation of crankshaft hub ensure timing mark points upwards  . NOTE: Crankshaft hub bolt MUST only be used once. Tighten crankshaft hub bolt  . Tightening torque: 150 Nm + 45° + 15°. Tighten crankshaft pulley bolts to 8 Nm  . NOTE: Use crankshaft pulley holding tools to prevent crankshaft rotation. Refit blanking plug for cylinder block. Tightening torque: 50 Nm. Refit blanking plug for timing chain front cover  . Tightening torque: 50 Nm.